New York City is notorious for its expensive real estate, and its market shows no signs of slowing down. In April, a report from the Douglas Elliman real estate firm announced that Manhattan real estate had hit an average price of $1,363 per square foot. That makes NYC one of the most expensive real estate markets in the world. Real estate prices are consistently high across Manhattan and the other boroughs. However, prices are especially high in neighborhoods like the Upper East Side, the Upper West Side, Soho and Tribeca. Brooklyn used to be the “cheap” borough, but its popularity has sent its real estate prices soaring, especially in neighborhoods like Park Slope. One of the best ways to make more of square footage is to use NYC space saving furniture like a wall bed or a transforming table. This furniture allows you to get double duty out of a space. For example, a space saving dining room table may transform from a simple desk to a long table that can seat a dinner party. A transforming kitchen table may look like a coffee table by day, but then turn into a dining space by night. These tables allow you to turn your living room space or home office space into a dining area at night. You don’t have to have a dedicated room for each. A wall bed can fold down at night for sleeping, but then be tucked away during the day for entertaining, working out, or working in a home office. You can also add a wall bed to easily transform a working room into a guest room when you have visitors. Expand Furniture offers the space saving furniture you need to make your NYC apartment feel more cozy and inviting for both you and your guests. You don’t have to clutter your space with a lot of furniture that you aren’t using all the time. 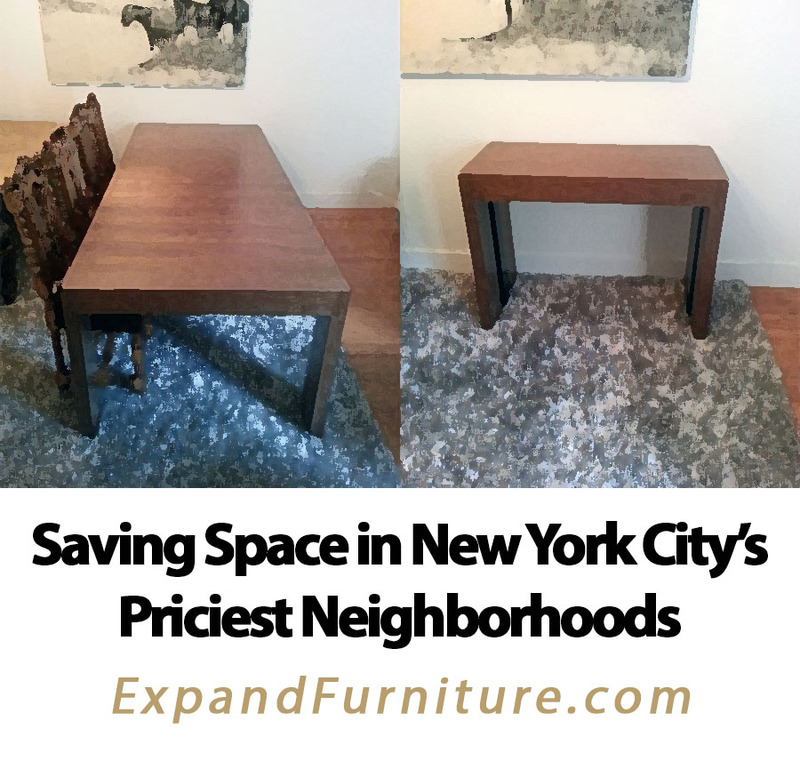 Instead, you can use NYC transforming furniture to make the pieces do what you need when you need them, taking up only as much space as necessary in each moment. Explore our online catalog to find the options you need, such as a transforming kitchen table, space saving dining room table, wall beds and more. The furniture comes in a variety of styles to fit in with your home décor. You can get all the functionality you need out of the furniture without taking up more of your valuable space. You don’t have to give up on the idea of big city living because you can’t afford it. You just need to find the right solutions for living in a smaller space. What Are Good Storage Furniture Solutions For a Child’s Room?